GitHub - crimx/ext-github-release-notifier: Chrome extension / Firefox Add-on for watching Github releases. 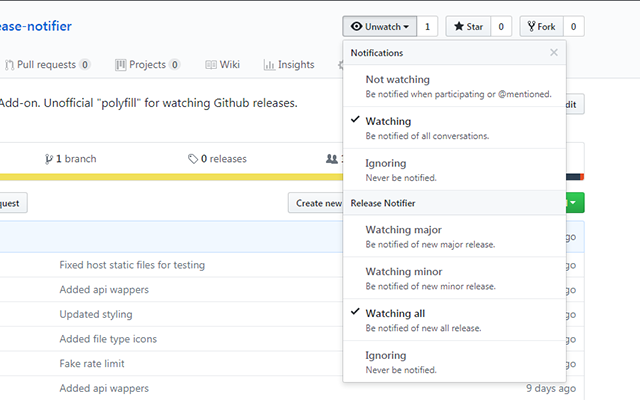 Chrome extension / Firefox Add-on for watching Github releases. Want to be notified of new releases in crimx/ext-github-release-notifier? Unofficial "polyfill" for watching Github releases. It was based on this lovely idea. Fast & light-weight: It is loaded and run only when needed. It uses Github api and takes advantage of 304 cache. You can also switch to atom feeds for unsupported repos. Clone repo, cd in and run yarn install. Tweak UI with random fake data: npm run dev (not yarn). Quick build (without optimization): npm run build --debug --devbuild. Full build: npm run build. Both Chrome & Firefox outputs are in dist/ folder. If you need to test oauth, edit src/api/oauth-data.js, add custom oauth client ids and secrets. You can also untrack it locally.